Most of us have sent at least one text or image we later wished we could take back. And thanks to WhatsApp's latest update, that wish has now become a reality. WhatsApp has introduced a new 'delete for everyone' feature, allowing users to unsend an embarrassing message within seven minutes of sending it. The feature is currently rolling out to users on Android and iOS, although it is unclear how widespread and quickly the launch will take place. WhatsApp has introduced a new 'delete for everyone' feature, allowing users to unsend an embarrassing message within seven minutes of sending it. The feature is currently rolling out to users on Android and iOS, although it is unclear how widespread and quickly the launch will take place. Similarly, if you see 'This message was deleted' in a chat, it means that the sender deleted their message for everyone. There is a catch – you can only delete messages for everyone for up to seven minutes after sending, after which point, there's no turning back. 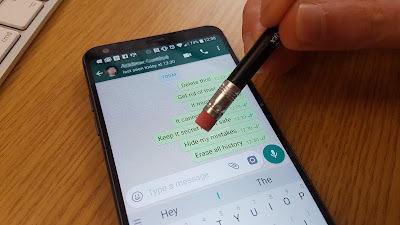 Whatsapp also warns that even if you delete a message, the recipient may still have had a chance to see and open the message.